Xbox 360 is video game console released on 2005 which brings lots of fun to people. And video can be played offline through Xbox 360.The videos from USB storage device, Windows Media Player, Windows Home Server and Windows Media Center can be played on Xbox 360. Except offline service, users enable to play games online, download games through Xbox Live Arcade,purchase and stream music, watch television programs, and films through the Xbox Music and Xbox Video portals, and access third-party content services through media streaming applications. Play online games, Xbox 360 supports the following formats: avi,divx,wmv,MP4,m4v,MP4v,mov. According to the list above, it compatibles with MP4 video format. When you try to stream MP4 to Xbox 360 with Windows Media Player, the program notifies “no videos found” in the MP4 folder. It means Xbox 360 only support MP4 formats with fixed specification to import into it for playing. So not all MP4 can be played on Xbox 360. Users want to play MP4 video on Xbox 360, the MP4 format video should meet the above specifications. Besides the above listed specifications, users must be sure the MP4 video is not larger than 4GB. How to make MP4 format played on Xbox 360 without considering its specification? The direct and easiest solution is to convert MP4 formats to adapt to Xbox 360 for enable MP4 video to play on Xbox 360. So converting MP4 format to Xbox 360 format is being considered. Avi format, as a matter of priority, is preferred consideration for xbox 360. Among all MP4 to Xbox 360 Converters, Leawo Video Converter is widely used and gains more credit. 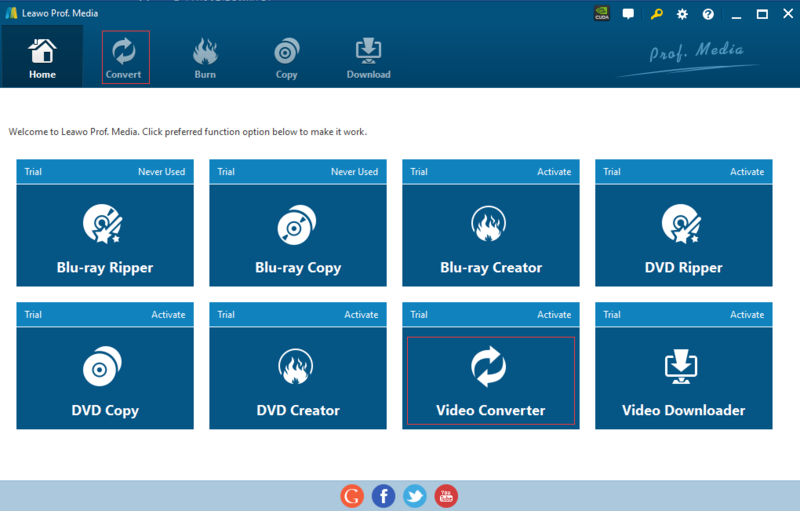 Leawo Video Converter is the program and also the tools that enables users to convert large number of video and audio format effectively, make these files compatible with all devices with faster speed and original quality. Differ from the free converter and a part of paid converter, Leawo Video Converter owns 2D to 3D conversion feature and powerful editing function, which make users instantly broaden user entertainment option with 3d video visual effect automatically. The Converter makes conversion process easy, with a nice, fluid drag and drop feature. This means users can stack up videos to be converted quickly, leaving users time to get on with other things. Except that, users can customize their video with special effects. Compared with all the converters on the market, its easy-to-controlled interface, user-friendly operation, the fast speed outputting with originally quality kept offer users a best option to convert MP4 to Xbox 360. Leawo videos converter becomes compatible well with quite a lot of devices, phones, tablets, PCs, websites, etc. Is there any method to convert MP4 to MPG? The answer is yes! Here in this post, I will share 2 ways to help you enjoy your videos on DVD player whatever their suitable formats are. Step 1. Download Leawo Video Converter from official website; install it in your computer. Or you can directly click the download buttons below. Step 2. After the downloading and installation is finished, click the program and upload the MP4 file to convert. Tap on “Convert” button in homepage，alternatively，select “Video Converter” in the bottom right pane to starting conversion. Step 3: Import MP4 format video to the program, drag the MP4 video directly or tap on “Add Video” icon on the top of navigation bar, find the files you need to convert for uploading. Step 4. Select the video format. Enter “MP4 video”, and then click “Change” to enter “Profile” panel, select the profile according to the output format you want. Using the search bar to find any desired profile is highly recommended that make users can find the format they want at faster speed. Or tap on “Convert” button directly to change. Step 5. Select the output format location in your computer and then click the button “Convert” to start converting. After several minutes, MP4 video will be converted to xbox 360 format you want. You can enjoy it freely on Xbox 360 or play it at any device that you want to play. That was all steps you needed to know before you want to play your MP4 video on Xbox 360 fluently. Can Xbox 360 play MP4? —YES. You can convert them to any audio format you want according to your devices as well. Leawo Video Converter is designed with no limitations and low costs. 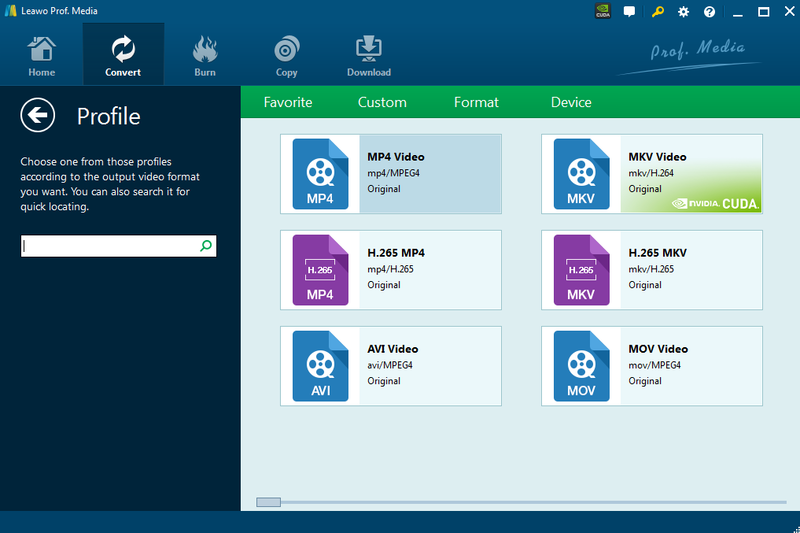 It lets you effortlessly convert any video files to any format for FREE, also convert MP4 to Xbox 360 format freely. Personalize your MP4 video and enjoy the video free with Leawo Video Converter now.